For years and years it has been believed that cetaceans were incredibly smart, with intellectual abilities second only to those of humans. Dolphins in particular were branded as being the equivalent of underwater humans with abilities such as alloparental care, language and dialects, mirror self-recognition and the understanding of grammar and cultural transmission of information and many more non-scientifically tested hypotheses. Given all these features, it seems difficult to deny some form of higher intelligence, but what I want to talk to you about is a controversial study being carried out by Paul Manger of Johannesburg's University. From his study Manger pointed out that the dolphin brain is largely made up of glia. Glia are cells that are thought to fullfill the brain’s “housekeeping” functions, such as producing heat so the brain's other main component, neurons, can work properly. 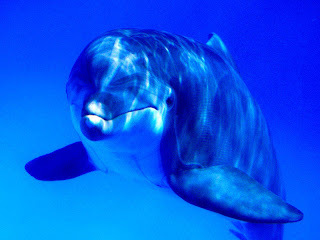 Like all mammals, whales and dolphins need to maintain a body temperature of 37 degress Celsius. But in water heat is lost 90 times faster than it is on land and Manger suggests that the relatively large brains of cetaceans developed as a result of the need to maintain heat and not to produce intelligent behaviour he goes on to point out that the mammals perform tricks, such as jumping through hoops, because they are conditioned to do so for rewards, such as food. Dolphins and whales lack complexity at the neuron level and this more than anything compromises the rest of their information-processing abilities and points out that Cetaceans really may not be as intelligent as we have always thought them to be.